Our winter dog coats were thoughtfully created to meet your dog’s individual needs during colder weather. Our garments offer protection for a wide range of winter conditions and activity levels. They protect from temperature, rain, snow and wind. Our coats are generously cut and made with your dog’s comfort in mind. Sometimes one garment may not meet all your dog’s needs. 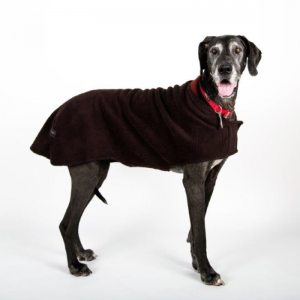 A warm coat for your dog in the outdoors can be complemented with a sweater for indoors. We’ve tried to create a garment for every situation. We do alterations for free. Our winter dog coats have been painstakingly field tested for maximum coverage and range of motion. This means that warmth and protection from the elements hasn’t been sacrificed to allow for activities that require full range of motion. We have been mindful of the needs of older dogs, ill dogs and short-haired dogs with no undercoat who may be more susceptible to winter weather. Our dog coats are useful for very active athletic dogs, older and ill dogs, hunting dogs, dock-diving competitors and dogs that travel with their families to colder states. We make matching snoods to keep cold ears/heads/necks warm. Our warm fleece blankets will soon be available in the size you need for cold nights. We are happy to take special orders to accommodate unusual situations.